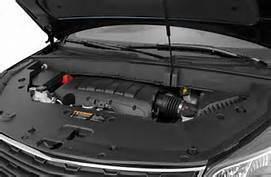 Under the hood, the Traverse LTZ has the power to go anywhere with 288 horsepower and an EPA-estimated 22 MPG highway. Including all the extras you desire. Like subtle touch surfaces, and convenient Smart Slide® second-row seating which allows easy access to the third row. LTZ amenities include heated/cooled seats, tri-zone climate control, and sliding armrest with storage. When it comes to space, Traverse goes big. 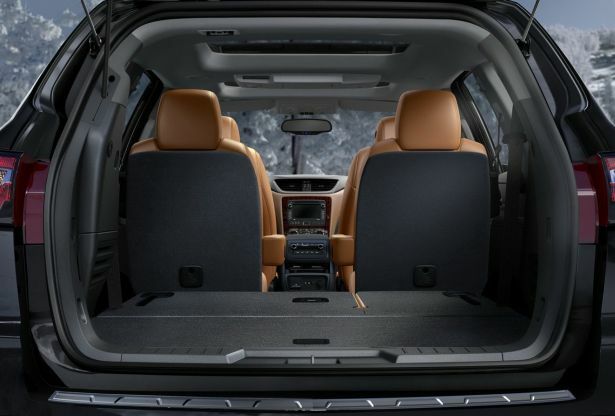 With 116.3 cubic feet of maximum cargo space and 24.4 cubic feet behind the third row, Traverse is a best-in-class Midsize SUV. Plus, seating for up to eight and added versatility makes it easy to pile it all in. Traverse offers a variety of available safety technologies to help you identify a potential hazard so you can prevent and protect occupants from dangerous conditions on the road. Available Forward Collision Alert utilizes an innovative camera sensor to scan traffic for stopped or slowing vehicles in front of you and will sound an alert so you can take appropiate action. While in reverse, available Rear Cross Traffic Alert uses radar sensors to monitor traffic behind you, and the standard rear vision camera is there as well to visually warn you of potential vehicles. In addition, Rear Park Assist, Side Blind Zone Alert, and Lane Departure Warning are available. An available industry-first Front Center Air Bag, helps protect the driver and passenger from colliding with eachother in the event of a passenger side collision. Furthermore, the high-strength steel safety cage adds even more safety! If a collision occurs, Traverse acts quickly with the available OnStar® Automatic Crash Response System, apart of the Guidance Plan, which is standard for three months. Crucial information is passed onto trained OnStar® Advisors, who will then request emergency assistance, even if you’re unable to respond.